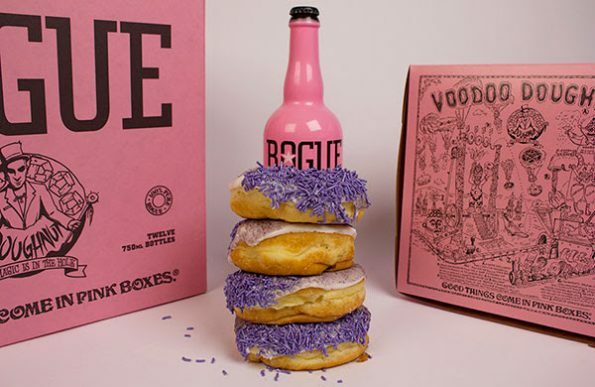 Rogue Ales announces the release of Voodoo Doughnut Grape Guerrilla Ale, the sixth in its line of doughnut-inspired beers. Voodoo Doughnut Grape Guerrilla Ale is based on Voodoo’s Grape Ape, a raised yeast doughnut with vanilla frosting, grape dust and lavender sprinkles. In this collision of crazies, Rogue Ales and Voodoo Doughnut continue to rally in their fight against boring beer. Rogue approached us six years ago and wanted to make a beer that tasted like our doughnuts. After a lot of trial and error, we created Bacon Maple Ale and it’s been great ever since,” said Kenneth “Cat Daddy” Pogson, co-founder of Voodoo Doughnut. “The beer is fantastic. It’s got a great grape essence and doesn’t taste like cough syrup. It’s grape in a great way,” said Rogue President Brett Joyce. Voodoo Doughnut Grape Guerrilla is available in serigraphed pink-painted 750-milliliter bottles worldwide starting in November. For more information about the Revolution visit rogue.com. Voodoo Doughnut is the brainchild of old friends and entertainment-minded Portlanders Kenneth “Cat Daddy” Pogson and Richard “Tres” Shannon. In 2000, Cat Daddy and Tres decided to embark on a shared entrepreneurial venture — something that combined quality hospitality with their daring do-it-yourself brand of show business. Voodoo Doughnut now boasts of six locations: found in Oregon, one in Denver, CO, and a brand-new international outlet in Taipei City, Taiwan.